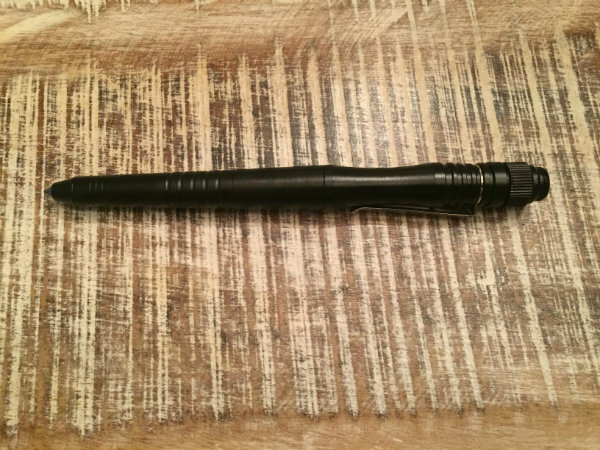 Simply put, the Survival Hax Tactical Pen is a multi-functional pen that includes a glass breaker tip that can also be used as a striking kubotan. The contoured grip lets you hold it tightly for this purpose. The opposite end is an LED flashlight. 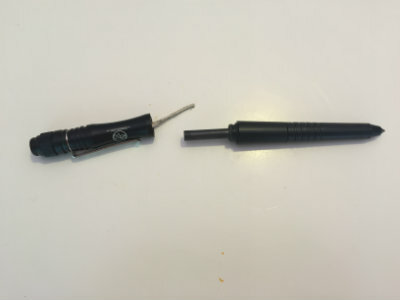 Unscrew the flashlight and you have a fire starter rod. Lastly, but not least there is the pen itself, easily accessible under the glass breaker cap. I will go ahead and tell you at the beginning of this review that I am partial to Rite in the Rain and Fisher Space pens for my EDC needs. I have been using these since my early days in the military and often gloss over new things if I have something that already works. 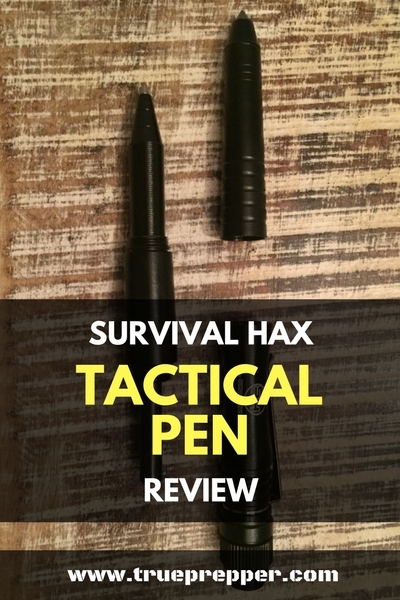 Survival Hax sent me a tactical pen to review, and I was interested- but not excited to review it. The pen arrived quickly, in a pretty nice box with a foam molded insert. My mind changed quickly after going over the functionality it provides in a small package. I took it out and was kind of surprised at the reasonable weight. The glass breaker comes to a hard, sharp point- but it does not snag anything and has not damaged any clothes since I started carrying it. Before it arrived, I half expected it to punch holes in all of my pockets if I carried the pen there! I scribbled some with the pen, and instant ink is always promising. I left the screw on kubotan cap off to see if the ink would dry out over the weekend, basically looking for any fault. I moved onto the LED flashlight. It is a contact screw type flashlight, where you twist the lens to turn it on and off. The machining is good enough to where you won’t have the lens fall off on you with the light off, and I have not had it turn on by accident in my pocket either. Lastly, the ferro rod. It is a magnesium fire starter that kicks out hot sparks when hit with a steel surface. Most good ones go for about $10 on Amazon, so I did not have high hopes for this built in rod. Well… I was wrong. Sparks flied on the first try, and it was very easy to handle. After checking out the how all four functions performed, I left it out uncapped to try and test that ink. When I came back on Sunday to pop the cap back on and bring it to work, it was slightly dried out but the ballpoint cleared it up immediately. I can’t come up with many complaints, so instead I looked at possible upgrades. Although I tested the pen for drying out, I still wanted a solution for a pressurized pen that would write in any condition. To me, there is nothing worse than a pen that doesn’t write. It has one job! (Well, four in the tactical pen’s case!) While I did not experience an ink failure so far with the tactical pen, I feel like it may be inevitable just because it is designed with a traditional ballpoint refill. 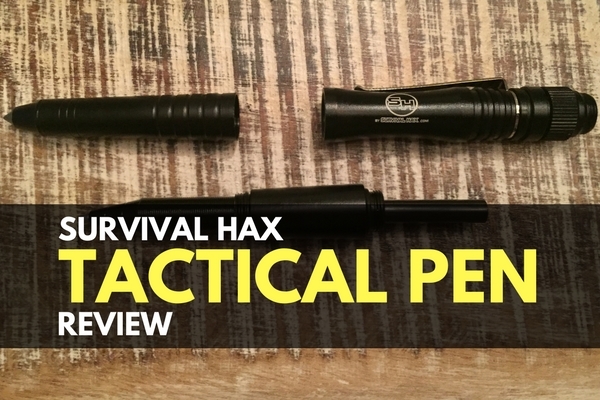 I went on a mad scientist mission to retrofit a pressurized refill into the Survival Hax pen. The next upgrade I decided to pursue was adding tinder to the pen in combination with the fire starter for a total fire solution. The ferro rod does not fit snugly into the end cap of the pen, so there is a little room in there just big enough to stuff some flammable material. This could really help me out in a tight spot if the weather is not cooperating. I’ve been using it solid for about two weeks now and have replaced my Fisher Space Pen with it as part of my EDC kit. The added weight is small and not noticeable when clipped to my pants near my folding knife. The clip is a must-have on this and appears to be good quality so it won’t lose its grip over time. 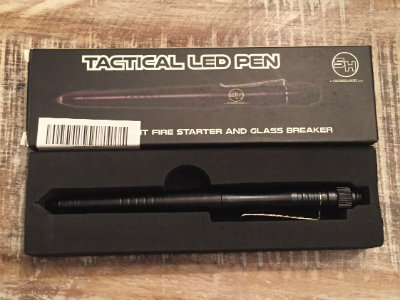 The attention to detail with the design of the tactical pen is awesome. The knurled grip is a nice detail, and being able to screw on the cap above the LED light is a nice way not to lose it. I have received compliments when I use the pen to write, but most people do not notice it. Being a firm believer in the gray man concept, I think this is a good attribute. Carrying around a tactical pen draws fewer questions than a mini Altoid survival kit, and has more practical uses.